I really love automatic watches. Pretty much all I have in my collection are automatics. The only issue I have with them is that I am lazy. Taking the time to wind them up, set the time, and set the date is sometimes enough for me to just keep wearing what I have on. To help me with this I got a cheap (cause I’m cheap) four-watch winder from Amazon. It looked nice, but in no time issues came up like limited winding modes and an increase in noise. I decided to set my sites a bit higher this time and see what quality watch winders were out there, and I found a good one. What I found was the Benson Smart Tech II watch winder (Editor’s note: we reviewed a prior model here). They are offered for 2, 4, and 6 watches. Prices are $599 usd for 2, $750 usd for 4, and $976 usd for 6 watches. Might seem a bit costly, but this is not your cheapo watch winder. I opted for the 6 watch winder and when it showed up I could not believe how heavy this thing was. The weight on this winder is 7500 grams or approx. 16.5 pounds. It came in what looked like a giant watch box with the from panel flipping down when pulling off the top of the box. The whole inside of the box is lined with felt and really shows a good sign of quality. When I pulled the winder out of the box I was impressed how how nice the finish was. The case is made of solid wood with a nice black lacquer look and really looks great. Each winder has a small drawer which is nice for storing extra straps of a couple extra watches. Everything inside the winder, including the drawer, are lines with felt. The door is made from mineral glass and is quite think. Inside the winder there is also an LED light you can use to show off what you have. Right above the drawer you will find the winders control panel. What makes this really worth the money is the amount of control you have. My cheapo winder had very limited controls so there were some watches I couldn’t even use on it. This Benson Smart Tech II let you set each watch individually and can work with any kind of movement. You can set them to rotate clock wise, counter clock wise, or both. Programming each one is so intuitive that you really don’t need instructions on how to do it. 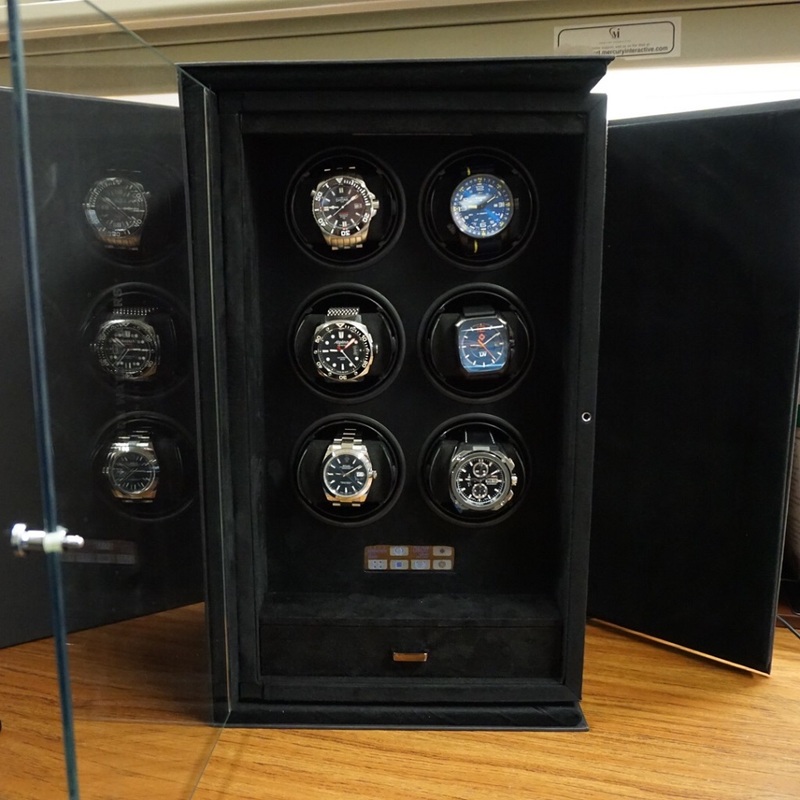 Its really cool to watch all six watches winding to their own individual programs. Each watch holder is uses spring tension to keep the watches securing in place. They can handle large watches and very small watches. I had no problem putting my wife’s small watches on them. There is no adjustment needed. Both the front and back of the holders have felt on them, so no worry about scratches.